Here's another fun team challenge to help you earn SB from Swagbucks! For those of you who don't know what Swagbucks is, it's a website where you can earn cash back on everyday tasks you do online. Swagbucks wants you to join in the fun! Pack your warmest snow gear and pre-register today! 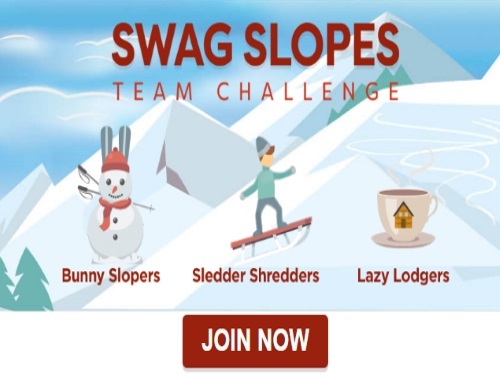 The Swag Slopes Team Challenge begins Monday, January 23. All members who participate and contribute at least 400 points to their team’s total will receive a SB bonus in the form of a SB Swag Up Rebate! Members of the 1st place team will receive a 40 SB Swag Up Rebate, members of the 2nd place team will receive a 20 SB Swag Up Rebate, members of the 3rd place team will receive a 10 SB Swag Up Rebate. Your SB Swag Up Rebate will be made available on Friday, January 27 and will expire on Sunday, February 12 at 7:59am GMT or 11:59pm PT. If you're already a Swagbucks member, click here to get assigned to a team.